Funding for the 2011 GAMA Award was secured by the successful applicant, Monique Watt, of the University of Aberdeen. She wrote on the economic history of the Western Isles, particularly of Lewis, from 1918 until around 1923 and featured the problems associated with the end of the War, the fishing industry, land hunger, attitudes towards perceived paternal interference and emigration. Her work is about to be published by the Islands Book Trust. The winner in 2010 was Robert Lenfert, an archaeologist undertaking a doctorate at the University of Nottingham. His book on the crannogs or fortified island dwellings that are found in the Western Isles and which are particularly prolific on North Uist, has now been published by The Islands Book Trust. The Award commemorates the work of two men. One is Herbert Gatliff (1897 - 1977), a pioneering member of the Outdoor Movement, who was keen to see people, particularly the young, visit the Outer Hebrides. 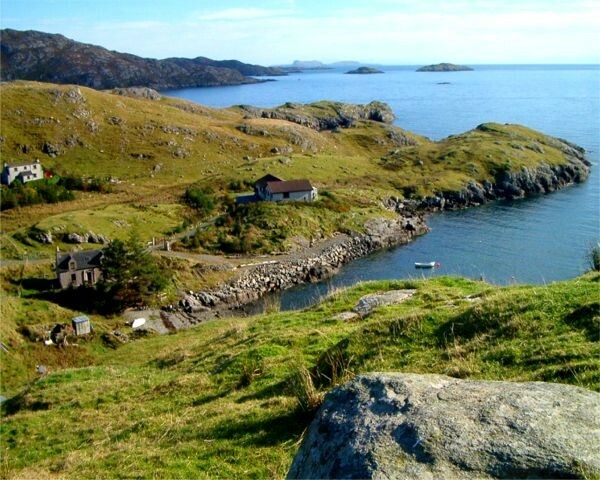 This enthusiasm led him to establish, in these Scottish islands, a network of hostels which continues to thrive. The other is Angus Macleod (1916 - 2002), born in Calbost in the South Lochs area of the Isle of Lewis, who created a remarkable collection of material relating to many aspects of local life. This is now stored in the Angus Macleod Archive, housed at the Ravenspoint Centre, Kershader, close to his place of birth. The view below is across the remote North Harris settlement of Rhenigidale, where the first Gatliff Hostel was established, towards the Shiants in the far distance.